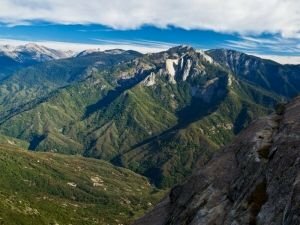 Sequoia National Park is located in Sierra Nevada, California. The park was created in 1890, on an area of 1635 square kilometers. Sequoia National Park is famous for its giant sequoias. Among them, the General Sherman tree. It is considered the largest tree on the planet. General Sherman grows in a Giant Forest, home to five of the ten largest trees in the world. Sequoia National Park borders the National Park of Kings Canyon and both give an idea of the park area as it was before all the people appeared. In the Parks Sequoia and Kings Canyon are giant redwoods and deep canyons, which are magnificent. They are located at the foot of Mount Whitney. Beneath the surface lie over two hundred marble caves, which contain endemic cave fauna. In the parks you can see various species of plants and monitor water, land and underground ecosystems. Although Sequoia Park is a protected area, it is not protected from many threats. These are air pollutants, invasion of alien species, loss of forests due to forest fires and human-induced climate change. The department of natural resources in the park is trying to explain precisely these dangers and threats to tourists. This is so they can mitigate existing and potential consequences of human impact on ecosystems. Tourist are explained to how to protect existing natural species. Many visitors enter the park in its southern entrance. The foot of the mountain is home to many wild animals - foxes, squirrels, snakes, black bears and mountain lions. In the park not only the redwoods grow, but other types of trees - such as California black oak. In spring and summer in the Park Sequoia are beautiful lush meadows. Most of the park is without roads. Much of the park can be crossed only on foot or by horse. This is because the park remains pristine, and at the time was the first home to the Indians Monachee. Every summer, local Indians traveled over mountain passes to trade with tribes to the east. To this day, pictographs can be found at several locations within the park, proving the existence of the tribe. When the first settlers arrived from Europe, they brought smallpox in the area, which destroys the local population. The first family settled in the area was that of Hale Tharp. He first left his cattle to graze in the meadows, but felt respect for the forests in the area and they were not cut. Tharp even led battles against logging in the area. The Tharp bungalow is visited today by tourists who arrive in the park. Tharp's attempts to preserve the giant sequoias did not enjoy much success. In the eighties of the nineteenth century, white settlers were seeking to create a society that lives on trading in timber redwoods. Before it became clear that the redwoods are easily crushed and therefore are not suitable for logging, thousands of trees were destroyed. National Park Service included the giant forest in Sequoia National Park in 1890. That year ends logging in the forest. It is believed that the park has over three hundred caves. For visitors to the park is only open one cave - Crystal Cave, which is very beautiful. The temperature in the cave is nine degrees. In 2003 a special program was created to protect the caves in the park after vandals damaged the entrance to Crystal Cave. 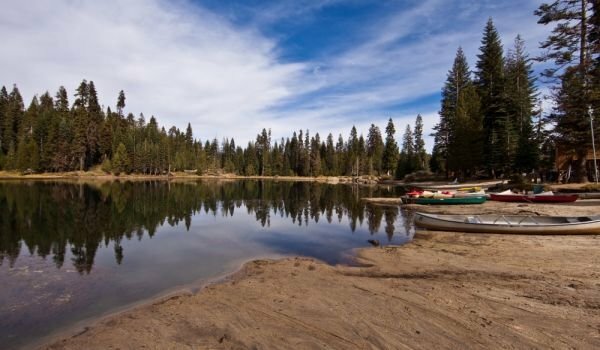 Park visitors can indulge in fishing, sleeping in a tent and moving through the path that leads to the General Sherman tree, which is long almost a mile. An interesting attraction is passing through a tunnel of redwood - a tunnel carved out of fallen redwood that has a diameter of over six meters and a length of over eighty meters. That Sequoia fell in 1937.